Finishing my trip on 11.08.12. The way to give information about the days when it's open and when closed was remarkable. I've seen such system so far in Latvia and Lithuania, not in Estonia. This place was also in "Vernanda", the man was running here. I entered yet another area, an area that was greener than others. It was very beautiful. That was Estonian school, very nice building. Local swiming pool. I regret not visiting it, I had everything with me, and I had time too. I hardly ever take pictures of people but the combination of these nice blue colours caught my attention. The map of the whole city. I started from the right side and moved to the left, then back to the lower part, to the road that goes through. That was it. I really liked the whole city! A masterpiece of different soviet-time architecture that any fan should see. Strange is that it was architecturally pretty complete: in certain areas there were similar houses, built at the same time. 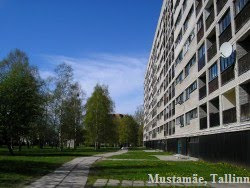 These areas looked like parts of a much bigger city like Tartu or Tallinn.